5 Beds 5 Baths 3,549 Sq. 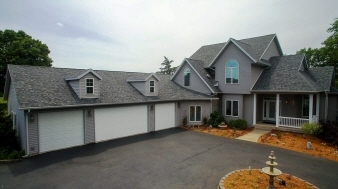 ft.
Privacy on this lush 1.2 acre home with river views! 1 1/2 story with 5 bedrooms and 5 bathrooms. 11' ceilings on the main floor. Over 3500 sq ft plus a full finished, walk-out lower lever to the fenced yard with a stone patio and path to your own floating boat dock! Relax on the bench to the sunsets that will knock your flip flops off! There are hardwood floors in your 17 x 14 eat-in Amish kitchen with granite cabinets with an island, built-ins and walk in pantry. A beautiful formal dining room welcomes your dinner parties and the 3 season room invites you to eat breakfast overlooking the river and wildlife. 2 master suites both with large jetted tubs- 1 on the main floor with radiant heated floors and his and her vanities and the 2nd on the upper level. Main floor laundry too!! Wait till you see the 4 car, insulated and heated dream garage large enough for your toys. So much more too I can't list it all!